Kefta Mkaouara—also spelled kefta mkawra—is a delicious and popular Moroccan tagine of meatballs and spicy tomato sauce. Eggs are typically cooked on top of the dish as shown, but these can be omitted. The kefta mkaouara—or meatballs—can be made from ground lamb or beef, or a combination of the two. The sauce should be prepared from scratch using fresh, ripe tomatoes. The following photos show the traditional preparation of Kefta Mkaouara using this traditional kefta tagine recipe. 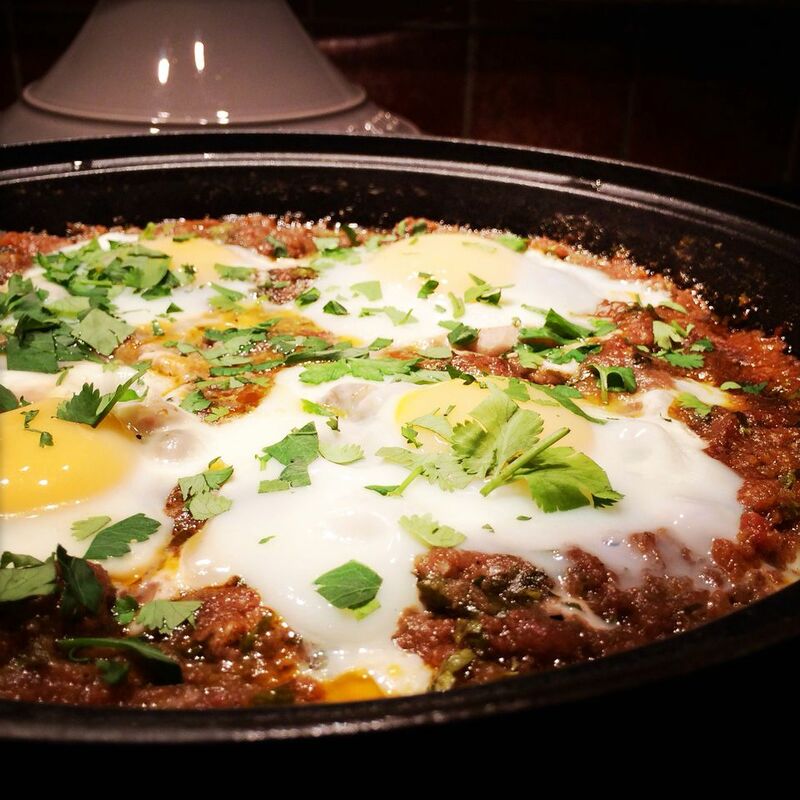 If you don't have a tagine, a deep skillet with a tight-fitting lid will work fine. You'll need 2 pounds—about 1 kg—of ripe tomatoes to make the sauce. If you don't have a kitchen scale, that's approximately 9 small tomatoes, 7 medium or 6 large. Start by cutting the tomatoes in half and removing the seeds, and then grate them directly into your tagine or skillet. Discard the skin. If you prefer, you can also peel, seed and chop the tomatoes. Following the kefta tagine recipe, add the onion, garlic, seasonings, herbs and olive oil to the grated tomatoes. Place the tagine or skillet over medium-low to medium heat, cover, and bring the tomato sauce to a simmer. If cooking in a tagine, use a diffuser between the tagine and burner. Be patient—it might take up to 15 minutes for the sauce to reach a simmer in a tagine. Once simmering, reduce the heat to the lowest temperature necessary to maintain the simmer. Leave the sauce to cook while you prepare the meatballs. Next, you'll make the kefta meatballs. Use your hands to knead everything together, and then shape the kefta into very small meatballs, about 3/4 inch in diameter. Add the meatballs to the tomato sauce, along with a little water—1/4 cup (60 ml) is usually enough, but you can thin the sauce even more if you like—and cover. Cook for about 40 minutes, or until the sauce is thick. Taste and adjust seasoning if desired. Break the eggs over the top of the meatballs, and cover. Poach the eggs in the sauce for an additional 5 to 10 minutes, until the egg whites are solid and the yolks are partially set. Kefta Mkaouara is traditionally served from the same dish in which it was prepared, with each person using crusty bread to scoop up meatballs from his side of the dish.